John A. Rich, M.D., M.P.H., is the chair of and a professor in the Department of Health Management and Policy at the Drexel University School of Public Health, where he is also the director of the Center for Nonviolence and Social Justice. A 2006 MacArthur Fellow, Rich founded the Young Men's Health Clinic in Boston and is the former medical director of the Boston Public Health Commission. An excerpt from a new book on how to help the most common victims — and perpetrators — of violent crime. Six weeks after Kari and I sat together in the surgi­cal clinic, I drove to Hyde Park to meet him at his grand­mother’s house. The house sat on a narrow two-way street not far off American Legion Highway, which lies just off Blue Hill Avenue, the main road that cuts through Roxbury, Dorchester, and ﬁnally Mattapan before coursing out of the city into the suburb of Milton. The house sat midway down a long row of attached two-story houses, a noticeable contrast from the cen­tury-old triple-deckers that lined Blue Hill Avenue standing di­rectly opposite these more modern and modest homes. 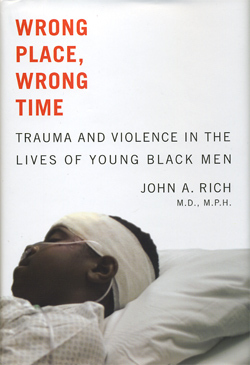 Wrong Place, Wrong Time: Trauma and Violence in the Lives of Young Black Men by John A. Rich, M.D., M.P.H. 232 pages. The Johns Hopkins University Press. $24.95.